Two weeks ago, I interviewed Geek Feminism founder Alex Skud Bayley about Geek Feminism, programming, and the Growstuff Indiegogo campaign. As a followup, I’m interviewing Frances Hocutt, who will work on Growstuff’s API if the fundraiser reaches its target. Frances is the founding president of the Seattle Attic Community Workshop, Seattle’s first feminist hackerspace/makerspace. She prefers elegance in her science and effectiveness in her art and is happiest when drawing on as many disciplines as she can. Her current passion is creating tools that make it easy for people to do what they need to, and teaching people to use them. She is a fan of well-designed APIs, open data, and open and welcoming open source communities. Frances is entering technology as a career changer, from a scientific career. She’s recently finished a Outreach Program for Women (OPW) internship, and she spoke to me about OPW, Growstuff, mentoring and friendly open source communities. What did your OPW project go? 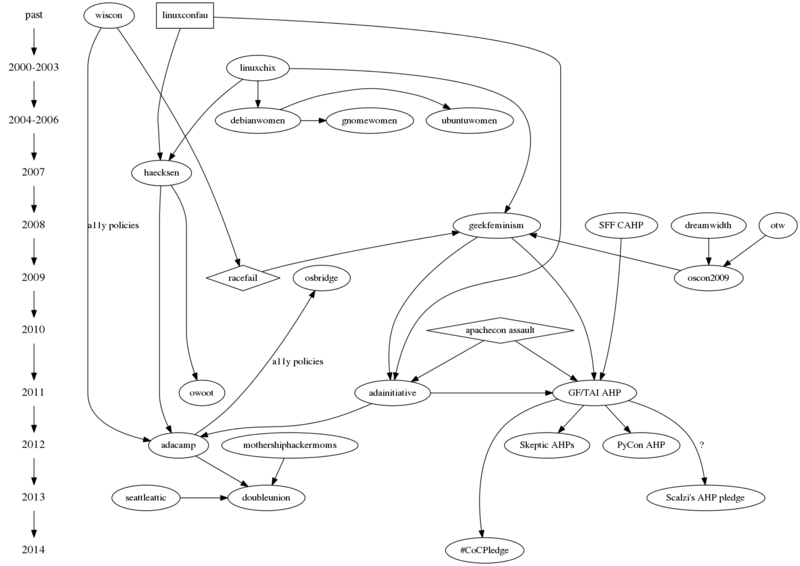 What attracted you to Mediawiki as your OPW project? This summer I wrote standards for, reviewed, evaluated, and improved client libraries for the MediaWiki web API. When I started, API:Client Code had a list of dozens of API client libraries and was only sorted by programming language. There was little information about whether these libraries worked, what their capabilities were, and whether they were maintained. I wrote evaluations for the Java, Perl, Python, and Ruby libraries, and now anyone who wants to write an API client can make an informed choice about which library will work best for their project. I am generally interested in open knowledge, open data, and copyleft, and I admire the Wikimedia Foundation’s successes with the various Wikipedias. When Sumana Harihareswara asked me if I might be interested in interning on this project for the Wikimedia Foundation I jumped at the chance. I was pleasantly surprised by how welcoming and supportive I found the Mediawiki development community. I had a good experience technically, professionally, and personally, and I learned a lot. What attracts you to Growstuff and its API as your next project, technically? I really like creating usable tools and interfaces, and when that comes with the chance to play around with APIs and structured data, that’s gravy. My favorite tech projects value developer experience and generally usable interfaces (whether for UIs or APIs). Growstuff’s current API makes it hard to retrieve some fairly basic data (given a location, when was a crop planted? ), so I’m really looking forward to the chance to have input into designing a better one. I also enjoy writing particularly clear and careful code, which I’ll be doing with my API example scripts so that anyone can pick them up, include them in their website or app, and easily modify them for whatever their intended purpose is. What attracts you to Growstuff as your next development community? The development community is the main reason I’m so excited about working on Growstuff. Growstuff is one of a handful of majority-female open source projects, and I definitely feel more comfortable when I don’t have the pressure to represent all women that sometimes comes when women are a small minority. Growstuff has great documentation for new developers, a friendly IRC channel, and an agile development process where pair programming is the norm. It’s obvious that Skud has fostered a collaborative and friendly open source community, and I’m looking forward to working in it. What can the technical community learn from OPW and Growstuff about mentoring and supporting people coming to tech from diverse backgrounds and oppressed groups? As I’ve come into tech, I’ve gotten the most benefit from environments where interpersonal connections can flourish and where learning is easy and ignorance of a topic is seen as an opportunity for growth. I credit much of the smoothness of my internship to being able to work with my mentor towards the shared goal of helping me succeed. inviting metacognition and feedback on what management approaches were working for me and which weren’t. Gatherings like AdaCamp have also helped me find people at various stages in their careers who were willing to openly discuss challenges and strategies. I’ve been building a rich network of technical women of whom I can ask anything from “how does consulting work” to “how much were you paid in that position” to “how in the world do I set up this Java dev environment? !” It’s amazing. I’m looking forward to more of the same at Growstuff. Growstuff’s pairing-heavy style encourages those connections, and Growstuff’s development resources focus on making knowledge accessible and not assuming previous experience. I’ve admired Skud’s work for years and I am delighted to have the opportunity to work with her myself. How are you finding the fundraising process for Growstuff? How can people best support it? Frustrating, in a word. The crowdfunding campaign I ran last year only ran for ten days, so I’m adjusting to the longer and slower pace of this one. Like many women, I often feel awkward promoting myself and my projects — even when I would be happy to hear a friend tell me about a similar project she was working on! I try to reframe it as sharing interesting information. Sometimes that works for me, but sometimes I still feel weird. That said: if you want to support Growstuff (and I hope you do), back our campaign! Tell any of your friends who are into sustainability, gardening, shared local knowledge, or open data why Growstuff is exciting and encourage them to donate! If you garden, sign up for an account and connect with other gardeners in your area! We’re trying to make it as an ethical and ad-free open source project and every bit helps. And if there’s anything you want to do with our data, let us know! We’d love to hear from you. This entry was posted in Uncategorized and tagged floss, fundraising, interview, sustainability, Tech industry on 2014/10/01 by Mary. In 2012, Geek Feminism founder Alex Skud Bayley founded Growstuff, a website and multi-purpose database for food-growers to track what they have planted and harvested and connect with other growers in their local area. Growstuff is now two years old and has launched a crowdfunding campaign to fund API development, which will help outside developers of tools like a harvesting calculator to show you how much money you save by growing food or emailed planting tips and reminders based on your location and climate. 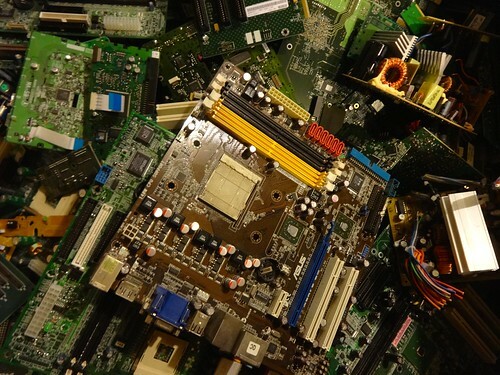 Skud uses open source software and related technologies to effect social and environmental change. She lives in Ballarat, Victoria, where she works on a variety of open tech projects for social justice and sustainability. Skud and I have talked in the past about how Growstuff is among the projects that Geek Feminism contributors have built on principles we brought to and out of Geek Feminism, and I’m kicking off the second week of Growstuff’s fundraiser by asking her more about this. Q. Which communities is Growstuff modelled on, and what principles has it inherited from them? In particular, how have Geek Feminism and other social justice communities and your work within them influenced Growstuff? Skud: When I started Growstuff, I’d been running Geek Feminism for about 3–4 years, and involved in a few other “women in open source” groups before that. This had led me to watch really closely as different open source communities worked on how to be welcoming and supportive, and to attract participants from different backgrounds and demographics. One thing I saw was that projects founded by women attracted women — no big surprise there I suppose! And, unsurprisingly, Growstuff has attracted a lot of women as developers: roughly half of the 40ish people who’ve made code contributions have been women, and we have lots who’ve volunteered for things like testing and data wrangling as well. Initially we modeled Growstuff quite heavily on Dreamwidth, which has a majority of women. (Dreamwidth was one of the projects I focused on in my 2009 OSCON keynote, Standing Out in the Crowd.) I also took inspiration from the Agile software development movement. Extreme Programming, which is the variant of Agile I grew up on, had a lot to say about having real conversations with people involved in the project, working at a sustainable pace, and using introspection to think about the process. I think some of the more recent versions of agile (like Scrum) have made it more business-friendly and, dare I say, macho. But to me, developing software the agile way is about working on the things that are most important, and about honouring each participant’s expertise and their time and energy they bring to the project. So Growstuff has a policy of working closely with our members, getting them involved in the project, and in some ways blurring the lines between tech/non-tech roles. Our choice not to use the term “users” is part of this; we use “members” instead because we feel like “users” distances the people who use Growstuff from the people building the code, and treats them more as consumers rather than collaborators. Agile development methodologies are probably not what you were thinking about when you asked about social justice movements, but to me, my feminism and the way I work on projects are closely connected. I certainly find agile development (which I do with clients as well as on Growstuff) to be a more egalitarian way of working together than traditional/non-agile approaches. Q. 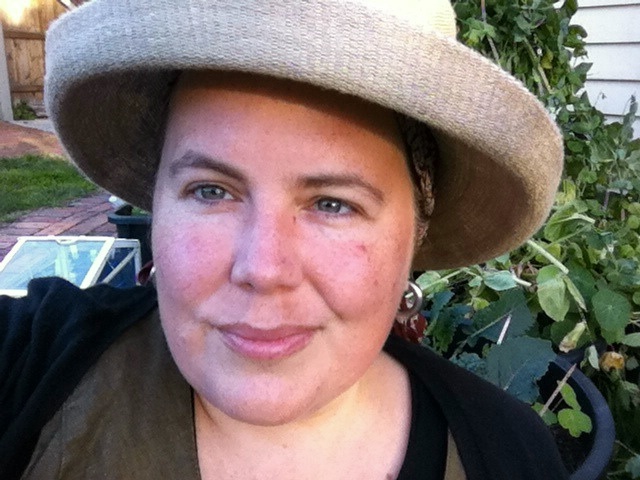 Your crowdfunding campaign will pay a developer, Frances Hocutt, to work on Growstuff’s API? Why is Growstuff moving towards a paid development model, at least in this case? Screenshot of Growstuff’s page for the Lettuce crop. So far, Growstuff’s been built by volunteers. My work on other projects (mostly doing tech contracting for sustainability non-profits) has funded my work on Growstuff, and other volunteers have generally been funded by their own day jobs. Unfortunately, requiring people to volunteer their time not only means you’re relying on their rather variable availability, but those who are likely to have the most availability are generally relatively privileged. That means that the contributor pool will be demographically tilted towards those who happen to be the most affluent and time-rich. In the feminist tech community, we’ve been talking for a while now about labor issues in open source: Ashe Dryden’s The Ethics of Unpaid Labor and the OSS Community is important reading on the subject. As a matter of principle, I want to be able to pay people to work on Growstuff. Maybe not all people all the time — it’s still an open source project, and our volunteer community is important to us — but I want our contributors to know that they’re not expected to go to extraordinary lengths without remuneration. That includes myself! I guess like many women I find it hard to ask for money for my own work, especially work for a “social good” that is so often undervalued and unpaid. It’s easier for me to ask for money on other people’s behalf. Frances is exactly the sort of developer I want to work with on Growstuff. 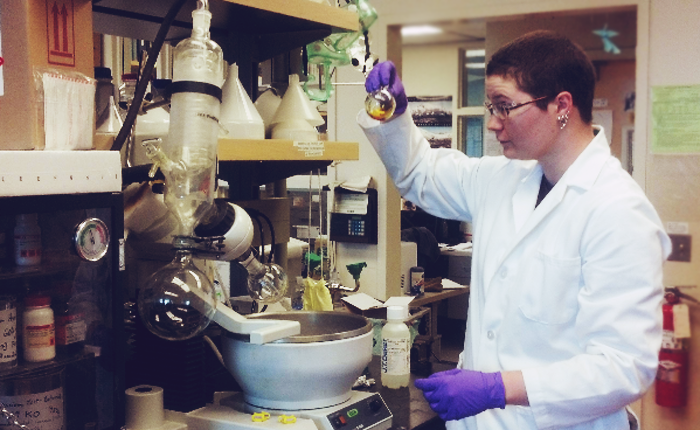 She’s come from a career in organic chemistry and switched to open tech. I got to know her through her co-founding Seattle Attic (a feminist hackerspace in Seattle, Washington), and through her Outreach Program for Women internship at the Wikimedia Foundation. By the time I met her I already knew she was a developer with a strong interest in community and collaborative projects, with the right combination of high level thinking, code, documentation and outreach. Her work developing “gold standards” for Wikimedia’s APIs (including the Wikidata API) seemed like a perfect lead-in to working on improving Growstuff’s APIs and helping people build things with them. When I heard she was looking for a short-term contract, I jumped at the chance to see if we could raise the money to pay her to work on Growstuff for a bit. What principles and techniques could other software projects adopt from Growstuff? And how does Growstuff fit in — or rather, not fit in — to the current venture funded hypergrowth model of software companies? We’re still trying to figure that out. Growstuff is structured as a sort of hybrid business/social enterprise: the website’s direct expenses are funded by memberships, while my work as Growstuff’s lead developer and organiser is funded indirectly by consulting on other projects. We don’t have any outside investment though we have received a couple of small grants and some support from a government startup program. We’re not seeking traditional VC investment, which makes us rather at odds with most of the “startup scene”, but I would much rather that Growstuff as a whole were funded by the community it serves, than by an external party or parties (investors, advertisers, etc) whose goals and values might be at odds with ours. The bigger-picture answer, I guess, is that 21st century western-style capitalism increases inequality. The rich get phenomenally richer, and the rest of us get screwed over. If someone offered me the chance to get super rich off Growstuff at the expense of our members and community, I sincerely hope that I’d be able to resist that temptation. Though to be honest, I think Growstuff’s insistence on copyleft licensing and other choices we made early on (such as not to serve ads) mean that nobody’s likely to make that offer anyway. I’ve intentionally set Growstuff up to be more cooperative than capitalist. The trick is to figure out how to fairly support our workers under that model. I think it depends a lot on our members: people are used to getting online services “for free” in return for their personal information and marketing data, which is used to make a handful of people very rich indeed. Are they going to be willing to resist that easy, attractive evil and become more equal partners in supporting and developing an online service for their/our mutual good? That’s what we still have to find out. I think the connection, for me, is through the idea of DIY — doing it yourself. My feminism is closely tied to my dubiousness about our current capitalist system. As I said, a system that concentrates wealth in a small segment of the population increases inequality. As businesses get bigger, our choices are fewer. I think growing your own food, even in a small way, is an important area of resistance: every pot of herbs on your windowsill means one less thing you buy from a giant supermarket chain. Incidentally, I feel the same way about building our own software and online communities! And I think that those who are least well served by the mainstream capitalist system — women, for instance, who are constantly bombarded by really screwed up messages about what we eat and how we feed our families, trying to sell us highly processed foods that ultimately benefit the companies that design and package them far more than they benefit us — have the most to gain from this. How can Geek Feminism readers contribute to or support Growstuff? Well, of course we have the crowdfunding campaign going on at present, to support Frances and myself as we work on Growstuff’s open API. We’re always looking for people to join our community as contributors: testers, data mavens, coders, designers, writers, and more. Even just diving in to our discussions and weighing in on some of the ideas there helps us a lot — we’re always keen to hear from food-growers (including aspiring/potential ones) about what they’re looking for in Growstuff and how we can improve, or from people who’d like to use our data, to discuss what they have in mind and how we can support them. Hi, I’m Alex Bayley. I write software and I grow vegetables in my backyard. I founded Growstuff in 2012. More and more people are taking up veggie gardening all over the developed world, especially in cities. That means millions of new gardeners trying to eat and live more sustainably. People are growing food in their backyards, on balconies and in community gardens. I started to grow my own food because I want to know where it comes from and that it hasn’t been grown with environmentally damaging fertilisers and pesticides. Like a lot of people these days, I worry about food that’s not local. The costs of transportation and the waste from overpackaged food are huge. I think it’s important that we have alternatives to the big supermarkets. And of course homegrown food just tastes so much better and it’s so much better for you. Like most gardeners, I’m always searching online for information. Most of the growing advice I find isn’t suitable for my climate. I need local information, not something from halfway around the world. Growstuff started when I met a guy called Federico from Mexico. He’s also a software developer and a permaculturist and he has trouble finding growing information for his local area. So he asked me if I knew of any open databases that had planting information about where to plant any kind of crop anywhere in the world. We looked around and we couldn’t find anything. Some governments release open data, but it’s usually aimed at big farms. The stuff aimed at home gardeners was usually either just for one region or else the websites had really restrictive rules about what you could use the data for. I’m a software developer so when I look at data I want to build things. If that data’s locked up where no one can use it that stifles innovation. 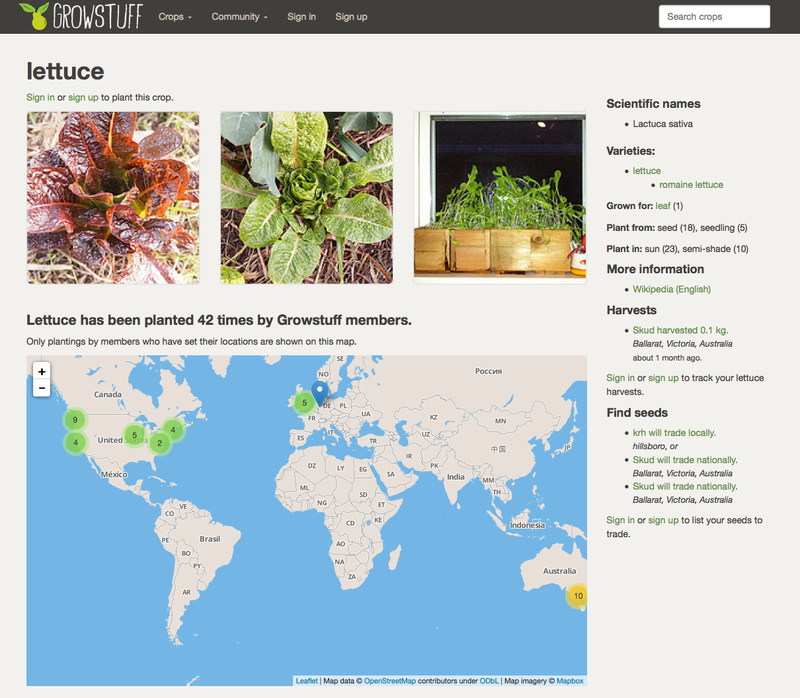 Growstuff crowdsources information from veggie gardeners around the world. We gather data on what they plant, when and where they plant it, and how to grow it. We use this information to provide local planting advice back to our members and anyone who visits our site. Growstuff is 100% open source and our data is also open. You can download it straight from our website and use it for any purpose, even commercially. But we want more people to use our data. We’re raising funds to improve our API which lets third party developers use Growstuff to build apps, mashups, tools, or to do research. With your help, we’ll be creating a new version of our API with more features, building demos, and running workshops for developers. 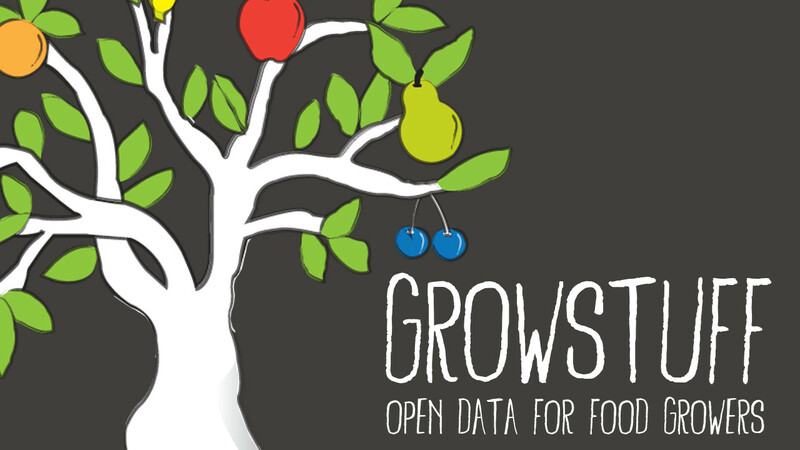 I’ve been working with open data since about 2007 and I think making food growing information freely available is one of the most important things we can do. Whether you’re a gardener or a software developer or you just care about sustainable food please support Growstuff’s crowdfunding campaign. Disclosures: in addition to working with Skud on the Geek Feminism project, I’ve worked with her when she was an advisor to the Ada Initiative, an AdaCamp staffer, and in several other capacities over many years. This entry was posted in Uncategorized and tagged floss, fundraising, interview, sustainability, Tech industry on 2014/09/16 by Mary. This entry was posted in Uncategorized and tagged anti-harassment, interview, trolling on 2014/07/14 by Mary. This entry was posted in Uncategorized and tagged anti-harassment, geek feminism wiki, meta on 2014/07/02 by Mary. This entry was posted in Uncategorized and tagged anti-harassment, geek feminism wiki on 2014/06/30 by Mary. GF classifieds: become a linkspammer to the stars! For two years linkspam have been emerging from our anonymous Linkspamming team like clockwork. But a few are on hiatus right now and it’s again time to refresh the roster. We’d love to bring a few more linkspammers on board. If you’re interested, read on. A Linkspammer gathers together links submitted by readers (and optionally links they found themselves) and puts them on our blog in a linkspam post. you paste that email into a WordPress post and start editing it, eliminating less good links entirely, and improving summaries, adding trigger warnings and such for the remaining links. You might optionally add links you’ve found yourself or sourced from somewhere else, but this isn’t needed. you make the post live. Most of the work of the linkspammer is now at step 4, where you exercise editorial judgement in including and order links and making sure all links have a representative quote or summary. ability to put up with occasional public criticism, and apologise if you agree you made a mistake: sometimes our readers criticise linkspams, although not very often, and unless they violate the comments policy we will generally let the criticisms remain publicly visible. willingness to read a moderate amount of email, as you’ll be part of discussions between Geek Feminism bloggers, and while our normal volume is 0–10 emails a week, in busy weeks it could rise to up to 40. We’d like it if the Linkspammer(s) could commit to at least six months as a spammer, and can give at least a couple of weeks notice if they need to move on, so that their replacement can be found and work handed over. The time commitment is around about one to two hours every time you sign up to do a linkspam post, perhaps a bit longer your first couple of times. You’ll do around two posts in every four to six weeks. Please note: we cannot pay Linkspammers (or any other contributor), you will be working as an unpaid volunteer. Let us know in comments if you’re interested in helping out as a Linkspammer: make sure to leave an email address in the email address field. Privacy note: because WordPress.com doesn’t allow a single post to have moderated comments, comments may be briefly made public if you’ve commented here before. We will make your volunteering offer private as soon as we can. Emails left in the email address box will not be publicly visible at any time. We don’t need a whole resume, but a sentence about your previous involvement in geek feminism would be good, eg “I’ve been commenting here for months” or “I write about geek feminism stuff sometimes on my blog” or etc. I just want to contribute links, not do entire linkspam posts! We welcome your help! You can contribute links without having access to the blog or needing to tell us you’re interested. The best way to do this is to sign up for a Pinboard account and begin saving links there tagged “geekfeminism“. If that doesn’t work for you, our automated link-gathering system now also checks the “geekfeminism” tag on the competing bookmarking sites Delicious and Diigo; the “#geekfeminism” tag on Twitter; and comments on existing linkspam posts. If it works better for you, make suggestions through any of those, they’re just slightly less well-tested than our Pinboard support. This entry was posted in Uncategorized and tagged classifieds, Linkspam, meta on 2014/06/02 by Mary. Ah, Mother’s Day, that time when our media and shopping spaces fill up with the assumption that “What Mum Wants” is a universal concept. Just once I’d love to see a ‘last minute gifts for Mum’ suggestion list that includes a kabuki sword, a new modem, and a chemistry set. Or maybe noise-cancelling earphones, and a new podcasting microphone. And a butler. This week, I’d just signed up for Lenovo’s mailing list in the hope of spotting a special, which it turned out was just in time! Just in time to be asked whether I was Fashionista Mum, Super Mum, Foodie Mum, Breakfast in Bed Mum or Bargainista Mum. A fellow geek feminist pointed out the inexplicable absence of Installing Linux the Moment It Arrives Mum. Funny that. Got any bouquets or brickbats for geeky Mother’s Day ads? Or anything else you want to talk about in an open thread? About open threads: open threads are for comments on any subject at all, including past posts, things we haven’t posted on, what you’ve been thinking or doing, etc as long as it follows our comment policy. We’re always looking for fluffy, fun, silly, cute or beautiful open thread starters, please post links to Pinboard with the “gffun” tag. This entry was posted in Uncategorized and tagged advertising, motherhood, open thread on 2014/05/11 by Mary. This is another round of Geek feminism classifieds. If you’re looking to hire women, find some people to participate in your study, find female speakers, or just want some like-minded folk to join your open source project, this is the thread for you! Geeky subjects only. We take a wide view of geekdom, but if your thing isn’t related to an obviously geeky topic, you’ll probably want to give a bit of background on why the readers of Geek Feminism would be interested. Explain what your project/event/thing is, or link to a webpage that provides clear, informative information about it. Ideally you’ll also explain why geek women might find it particularly awesome. Explain what you’re looking for. Even if it’s not a job ad, think of it like one: what is the activity/role in question, and what would it involve? What is the profile of people you’re looking for? GF has international readership, so please be sure to indicate the location if you’re advertising a job position, conference, or other thing where the location matters. Remember that city acronyms aren’t always known world-wide and lots of cities share names, so be as clear as possible! (That is, don’t say “SF[O]” or “NYC” or “Melb”, say “San Francisco, USA”, “New York City, USA” or “Melbourne, Australia”.) And if you can provide travel/relocation assistance, we’d love to know about it. Keep it legal. Most jurisdictions do not allow you to (eg.) advertise jobs for only people of a given gender. So don’t do that. If you are advertising for something that falls into this category, think of this as an opportunity to boost the signal to women who might be interested. If you’re asking for participants in a study, please note Mary’s helpful guide to soliciting research participation on the ‘net, especially the “bare minimum” section. This entry was posted in Uncategorized and tagged classifieds, hiring, open classifieds on 2014/05/02 by Mary. This entry was posted in Uncategorized and tagged geek feminism wiki, history of feminism, meta on 2014/04/02 by Mary.